Mayfair Brooks – teamgloria, inc. 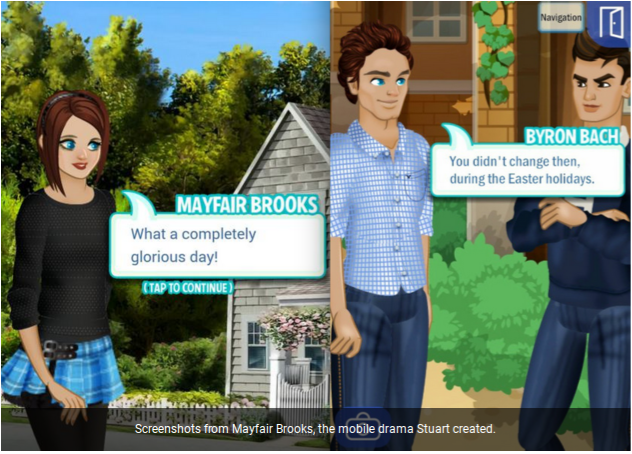 Commissioned by mobile app publishers Pocket Gems as a pilot in 2014, Mayfair Brooks was written, and directed, (and coded) by sophia stuart and became a full 15-part mobile episodic drama, which ran for a year on the Pocket Gems Episode platform. Mayfair Brooks is 17 and studying for her A’Levels (English Literature, Latin and Ancient History, in case you were curious) in a sixth form college by the seaside in England. She wants to be a writer but doesn’t know how to tell anyone. So she starts a secret blog about her lovely group of friends. Someone important in Manhattan spots her talent and she has to decide whether to follow her dream, even though it would be a good idea to finish school and go to University. What will she decide? And if she goes to NYC, what will she learn/see/do/become? Then there’s a mysterious trip to Paris – and her friend Byron ends up in Italy (and then in a lock-down mental health unit), meanwhile Salvatora is running from the secret service and her father is in league with the Mob.